Twelve-year-old Aru Shah has a tendency to stretch the truth in order to fit in at school. While her classmates are jetting off to family vacations in exotic locales, she'll be spending her autumn break at home, in the Museum of Ancient Indian Art and Culture, waiting for her mom to return from their latest archeological trip. Is it any wonder that Aru makes up stories about being royalty, traveling to Paris, and having a chauffeur? One day, three schoolmates show up at Aru's doorstep to catch her in a lie. They don't believe her claim that the museum's Lamp of Bharata is cursed, and they dare Aru to prove it. Just a quick light, Aru thinks. Then she can get herself out of this mess and never ever fib again. But lighting the lamp has dire consequences. She unwittingly frees the Sleeper, an ancient demon whose duty it is to awaken the God of Destruction. Her classmates and beloved mother are frozen in time, and it's up to Aru to save them. The only way to stop the demon is to find the reincarnations of the five legendary Pandava brothers, protagonists of the Hindu epic poem, the Mahabharata, and journey through the Kingdom of Death. But how is one girl in Spider-Man pajamas supposed to do all that? I remember sitting on flight home from a library conference with Roshani's The Star Touched Queen and having to use my phone to take photos of all the quotes and moments I fell in love. This is that moment you know that this will be an author whose work you will be counting down the days till you have the next book in your hands, ready to be devoured. 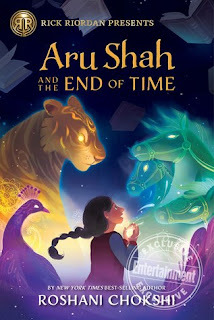 I have Aru Shah in my hands and was ready to devour it...metaphorically. Chokshi has such a beautiful and magical way of telling a story. Every word is another stroke of a brush that paints a picture that will last. We fall into a world with a girl, Aru, who is trying to fit in and trying fit in sometimes starts with a journey. An adventure where the world's fate is on the line and you, a girl who is somewhat related to you, and a pigeon with a dark past are the ones to save it. Aru is this heroine that so many people, especially young girls, can connect with. She is funny, smart, daring, and most importantly brave. And just like everyone she depends on her friends to help her overcome barriers. On this journey, she discovers who she is and what her destiny is and knows that sometimes failing is the first part in succeeding. 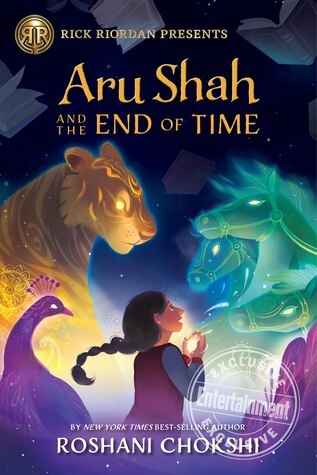 Aru Shah and the End of Time was the perfect choice of a novel for a debut imprint. If you are looking for a novel that will take on a mythical adventure that will leave you with an ending that results in only wanting more, this is the book for you. A beautiful masterpiece!